Bird Feeding Station Duo Kit is a medium duty 6 ft Bird feeder pole with 10" double hanger arms, an extra single hook arm, water disk, and mesh feeder tray. 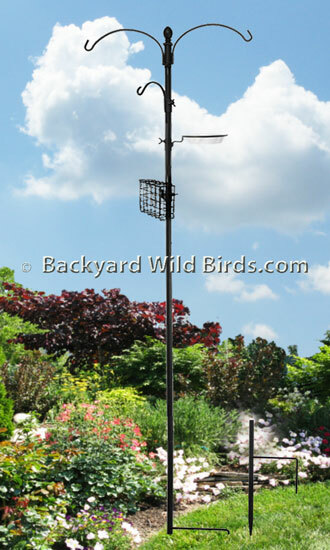 Pole is ready for a couple small bird feeders, an extra single arm, water tray, and suite bird feeder Creates a complete all in one bird feeding station. Kit includes: Double 10" reach hanger arms. The Small 5" single feeder hook, Bird bath support ring with 6.75" white bird bath and suite feeder, which have thumb screws to adjust their positions on the pole. The multi-section 7/8" diameter pole builds for overall full height of 7 ft 1 in (6 ft above ground). The Sturdy black powder coated steel pole and hangers will last for many years. Mounts in ground with a step stake ground socket. Great way to get started birding! Perfect for Hummingbird, and Oriole bird feeders sold separately.